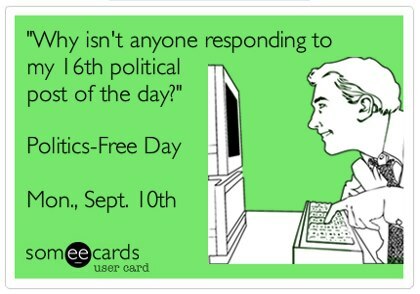 There’s a little social media call for a “Politics Free” day on Monday, September 10. You know it’s real, because “someecards” says so. I could try to avoid political posts on September 10. But I don’t know why I would. More important, I don’t know that I could. It’s true that it can get old, all my facebook posts on issues I care about, rather deeply. You know, things that “The Newsroom” staffers work on. But I did get very snarky about Paul Ryan (not remembering your one and only marathon time was beyond comprehension). And last night, I was just so excited watching the DNC speeches. I posted a few (okay, many) quotes from the speakers. Mostly though, I try to post things based on facts, or at minimum, highly and well-informed opinion. I don’t expect responses. I sincerely just want to share. I have a “politics” list specifically because I absolutely do not want to start arguments with people who I know disagree with me not on a numbers/policy level but on a visceral/soul level. For all I know people on my politics list “hid” me and my posts a long time ago. That’s cool. But as I think about it, if I’m not posting about our kids, or about cool health or science articles or recipes… I’m posting political stuff. I do it all the time, and not just during election season. Politics, to me, isn’t “just politics.” It’s about the way individuals think, the things they value, their goals, their resources. We contribute to our government with our tax dollars, dollars earned by hard work. Our government is supposed to reflect what we think, what we value, and make sure we have opportunities to meet our goals and that our resources are protected. I don’t know how not to think about politics. Especially now that we have two children, and parents over age 65. The stakes are really high. But maybe I’ll leave facebook alone with my politicking. Maybe I’ll refocus my energy here. I’m sure that someecards will be okay with that. I hope you will be, too. < Previous does a corporate wife = a PTA mom?